The title of this post refers to a self portrait (oil on canvas) painted in 1976 whilst living in Roma Italia attending the Academia di Belli Arti. I look at it now (It hangs on the wall above my computer), and a flood of memories come to me, the tsunami of culture that is Italy. One year into doing a degree at Caulfield Institute (now Monash University) I decided to leave and go to ROME. I was 20 years old when I arrived in Roma at the Stazione Termini, and literally walked out from the train station into a massive student demonstration, confronted an all sides by lines of helmeted riot police who beat a menacing drum sound with truncheons on plastic shields. The Australia that I had left, was to me a sleepy place, even though Gough Whitlam was giving it an almighty kick up the bum, but in reality the culture was still just emerging from the torpor of the Menzies years. So the pitched battle that was going on around me the tear gas, the violence, the civic unrest, the political battles that were being fought on the streets both scared and excited me. It all seemed to culminate when Pasolini was killed. Fellini’s ( then Pasolini & Lina Wertmuller) movies provided the original impetus for me to go to Italy, “Satyricon”, “Roma”, “Amacord”….I was 15 years old when I saw these movies with my parents, at the time I belonged to a Film Group that put on European movies at a cinema in Croydon. For me it was the beginning of my life long love affair with Italia. At a meeting on the 1st of March 2017 the Wurundjeri Elders formally approved the head study that I made of William Barak. Really important to Cinzia & I that we proceed with the Wurundjeri Elders blessings. One of the first large scale sculptures I carved in Carrara Marble (1986-87) The original block weighed around 12 tons, whittled it down to around 4 tons. The title translates in english as “Fear of Intimacy”. PS: Recognise the person laughing? 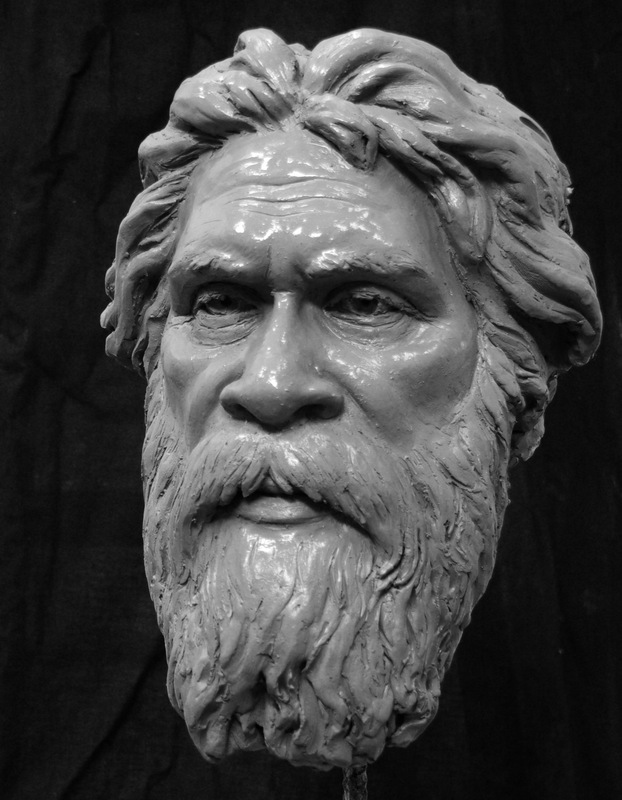 Bound for Italia, to resume work on the full size sculpture of William Barak to be cast in bronze…made quite a few studies including different head studies….and making more. 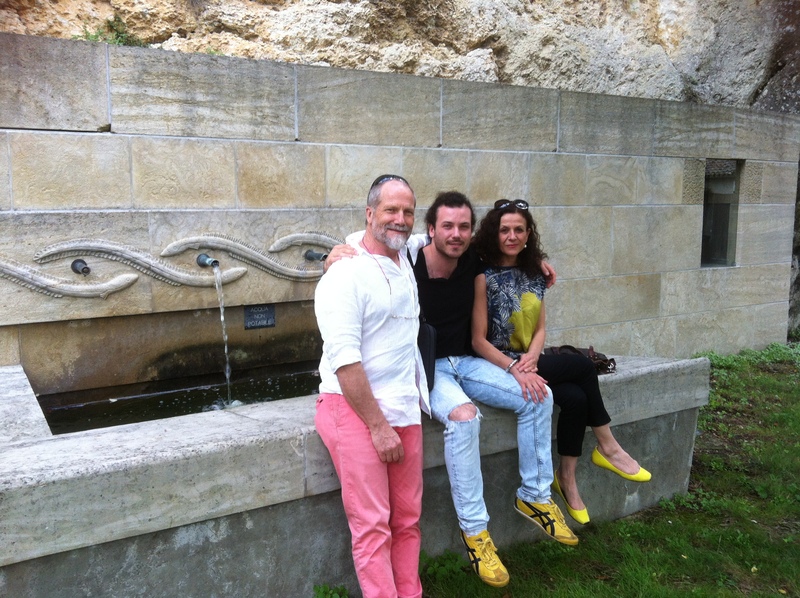 Wurundjeri Elder Alice Kolasa, my wife Cinzia Ruffilli and I with the “Portrait Building” in the distance. 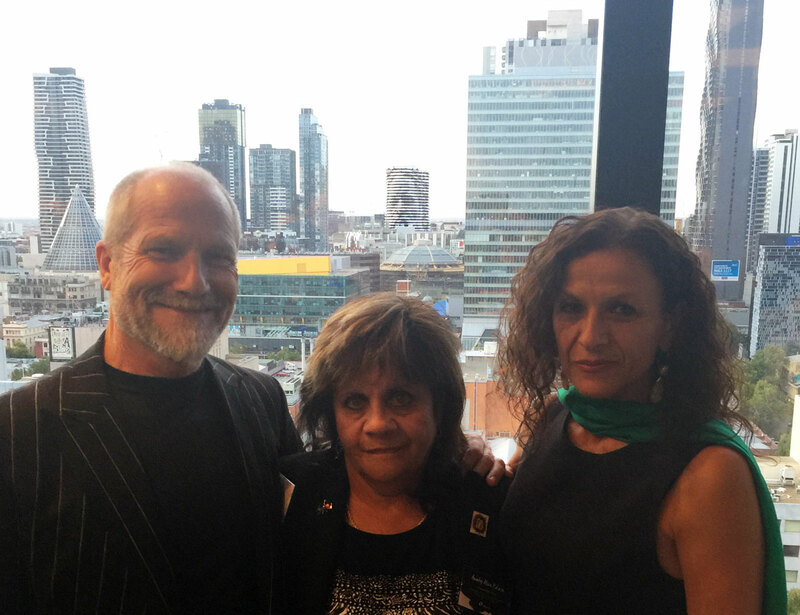 Last night Cinzia and I, attended along with Wurundjeri Elders and community, and many other invited guests, the official launch by Grocon Construction Company of their 85 meter tall apartment building. The launch took place on the 12th floor of the new Westpac Building from which we gained a spectacular view of the “Portrait Building” seen in the distance in the image above. ARM architects who designed this building were inspired by a portrait study in clay that I made for the sculpture of William Barak that I am currently working on. 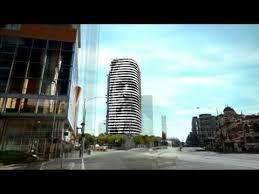 The portrait is created by modulating the shape of the white balconies against the dark colour of the windows. 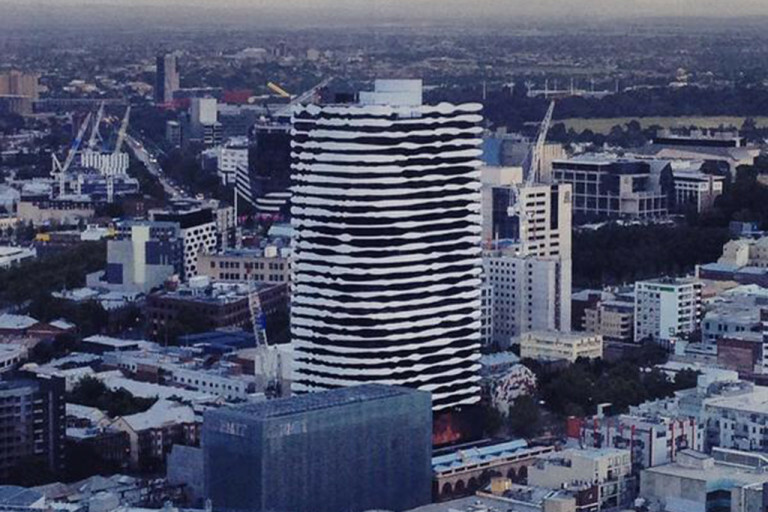 The gigantic scale of this portrait in the Melbourne skyline not only sets it apart as an iconic structure but as well is an extraordinary acknowledgment of this city’s indigenous history and a tribute to William Barak and the Wurundjeri. Congratulations to all at Grocon for this visionary building…the first of its kind in the world! Most Saturday mornings Cinzia and I go to the Vic Market to do our shopping, it’s amazing to think that something I have done with my hands in clay overlooks this city! Have been in Italia since Sunday the ninth of September. we flew in to Venezia and drove down to Ravenna staying with Armendina Ranuzzi family of Cinzia, Armendina is a remarkable lady now close to eighty years old indefatigable as ever one of the most generous humble people you could meet in your life, she often breaks into the dialect “romangnol” a language full of character and humour. 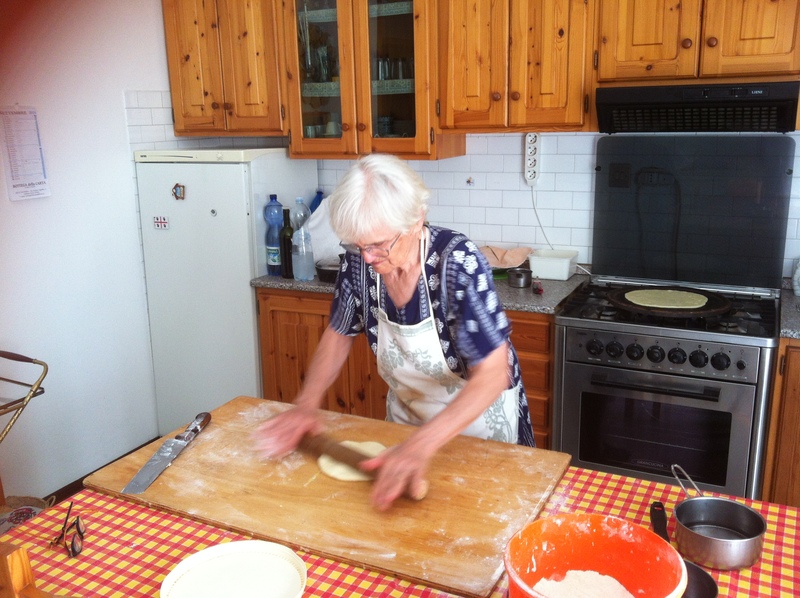 We have stayed with Armendina many times over the years that we have been coming to Italia. The last two days we have been with Denver in the Republic of San Marino Italia a company that produces high tech CNC machines for working stone. A fantastic company, the factory looks like an art gallery! We were given a wonderful experience. We came away moved and inspired by a organisation who have great pride in their company and what they produce. Being Italia “mezzogiorno” is of course the time to drink vino, eat and be happy. We were taken for lunch at a trattoria a good way up the mountains upon which the ancient city of San Marino is built. From where we sat we could see the crenelated walls snake along the ridges of the mountains above. We drove past a fountain that featured carvings in low relief of anguile (eels) our host Franco Barachini from Denver parked the car and we got out and wondered why there should be sculptured in “relievo” eels half way up the mountain. The trattoria had an outside eating area with great views we chose to have our tagliatelle con sugo and strozza preti with salsicce and peas washed down with glass of Sangiovese wine, bread parmigianno insalata flavours swirling on our tongues. We asked the lady serving us what was the meaning behind the l’anguille on the fountain she said she didn’t know, she then thanked us and added “I have been working here for years and never even noticed them!” On the table next to us a lady and her daughter overheard our conversation, she turned to us and said she heard of a story that they were the symbol of the god Mercurio, ( as well as the fact that Italians eat everything) we looked at the water gushing forth from the mountain and as is common in Italy, water has since ancient times been associated with the Gods. After lunch Franco took us to a stone masons workshop to show us one of Denver’s CNC machines in action. Franco introduced us to four artigianni “uomini della pietra” people who for me are like brothers, Cinzia got talking to one of the men who was operating the CNC machine and learnt that he studied under the same master that she did when she studied mosaics in Ravenna, their teacher was a person famous for restoring mosaics of Ravenna. She asked him about the fountain with the eels and it turned out it was his father that carved the eels on the fountain that we were fascinated by! 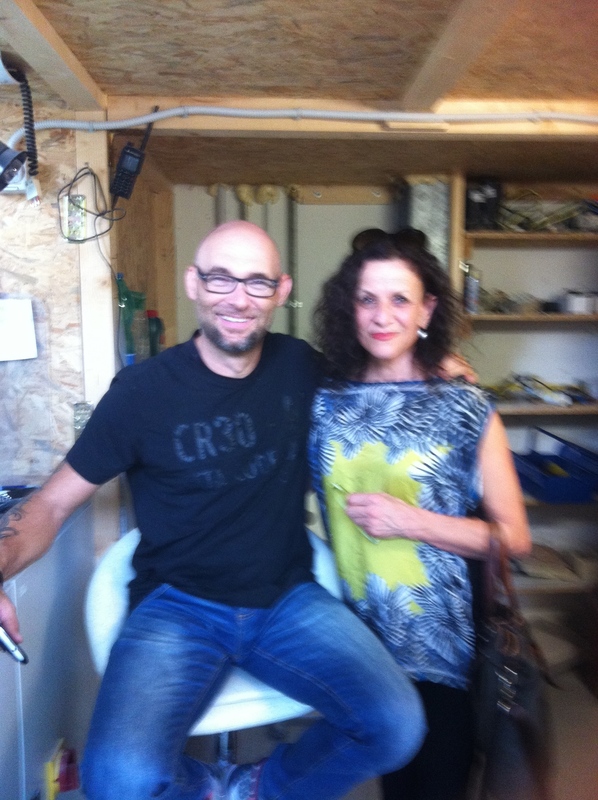 Cinzia with Bruno, who as students had studied under the same teacher. 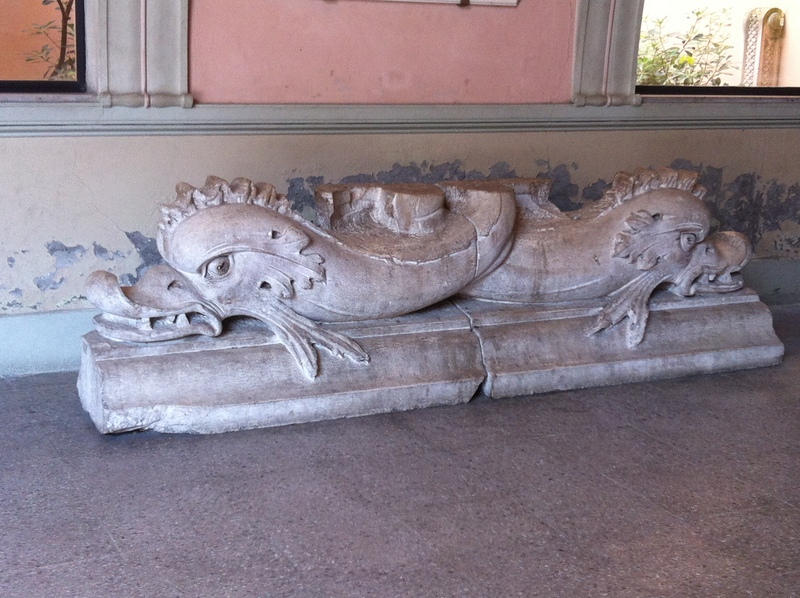 Bruno’s father carved L’anguille in alto relievo on the fontana near the trattoria we ate at.